Preferred Habitat: Marshes, mudflats and flooded fields. Seasonal Occurrence: Very common spring through fall. Less common in winter. Profile by Glenn Olsen: I like the White Ibis because it's an odd-looking bird. 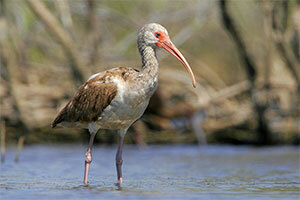 In breeding season, the White Ibis has bright white feathers and crimson-red facial skin, bill, and legs. Its colorfulness and its long, de-curved (or downward-curving) bill give it a strange appearance as it wades in the shallow waters of marshes, ditches, and bayous in search of marine worms, snails, young crabs, crawfish, and other tasty morsels. You can find these birds year-round in freshwater and saltwater marshes, such as at Anahuac National Wildlife Refuge, Brazos Bend State Park, Addick's Reservoir, or at any of the bay marshes along the coast. The adult is all white, with black-tipped wings. Immature birds are mottled white and brown, and otherwise resemble the adult birds. In flight, the way to distinguish a White Ibis is to look for its down-curving bill, long neck, narrow body, and legs that extend beyond its tail. You will most often see White Ibis flying in flocks numbering from 5 to 25; their flap, flap, flap, glide flight pattern will help you identify them. Whereas most species of birds use only one habitat for breeding, the White Ibis is unique in that it requires two habitats: brackish marshes and freshwater marshes. Adult birds feed in brackish water marshes and along the shoreline of bays, looking for young crab, small mollusks, and other aquatic food. 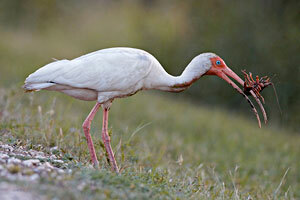 White Ibis chicks are unable to digest salts found in saltwater food organisms, so its parents must hunt for crawfish in freshwater marshes such as those found at Brazos Bend State Park and Addick's Reservoir, as well as in ditches and bayous around Houston. Every time a bayou is cemented or a development supplants seasonal wetlands in or near Houston, the numbers of White Ibis diminish. The White Ibis is a beautiful bird worth preserving, and provides yet one more important reason for us to speak up for protecting their habitat when we see it being threatened in our neighborhoods. Notes by Vicki Stittleburg: Easy to recognize, White Ibis stand 2 feet tall with pure white plumage and have a long, downcurved, red bill with a black tip. The face and legs are red. Black wing tips are visible in flight. Juvenile White Ibis are mottled white and brown, have an orange face and bill, dull orange legs and gradually transition to adult plumage. White Ibis occur year round in our area but are most common spring through fall. They can be found in salt, brackish, and fresh marshes, estuaries, mangroves and swamps. White Ibis forage by wading in shallow water, sweeping their bill from side to side and probing for crayfish, crabs, snails, marine worms, and small fish. They also forage on land for insects in fields of short grass. White Ibis breed in our area and are unique in that they require 2 habitats: brackish marshes to find food for themselves and freshwater marshes to locate food for their salt-sensitive young. Good places to observe these beautiful wading birds include: Anahuac National Wildlife Refuge, Brazos Bend State Park, Addicks Reservoir, Galveston Island State Park or at any of the bay marshes along the coast.